I've been writing a long time, but in 2011 I finally decided to publish one of my manuscripts. The inspiration came from the word Warfolkan. It started off as nothing more than a word I came up with while playing "Dungeons & Dragons". But, from it I created an entire fantasy world. And, for the past 33 years I've continually wrote stories about that world. Question: List all of your titles. For the past 20 years I’ve tried to write at least one manuscript every winter from the fantasy world I created. As for future manuscripts being published, that remains uncertain for now. 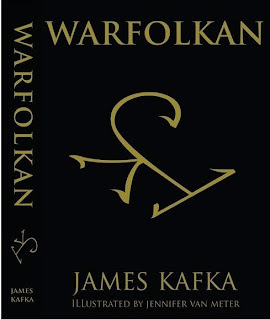 "Warfolkan", is my second book. A more complete version of what I tried to accomplish in the first book. I re-wrote book one and then added 17 more chapters, making Warfolkan a comprehensive novel. The plot truly begins when the main character, Wajue, meets a strange and mysterious woman, and sets in motion his journey of discovery. The resilient, but immature Wajue, constantly struggles to make sense of his unforeseen circumstances and is forced to rely on the woman if he is to survive. Ultimately, in the end, he will be held accountable for the consequences of his actions and the choices he has made. It’s a genuine action adventure narrative, with extraordinary unforgettable characters, and promises to keep the pages turning. The three main ingredients I use are a hero, a dash of mystery, and the reader’s imagination. Next, I toss in 3 to 4 handfuls of action, the wild and crazy monster kind. I then add two teaspoons of humor, because I hate when the plot gets too thick. I always use a cup of suspense, while I stir the plot. And I never forget to include several pinches of romance into the mix, just to spice up the story. And that’s what "Warfolkan" offers in the way of entertainment. Good to the last finger licking page. I understand everyone has a favorite genre they like to read, and if my book is not to their liking, I’m okay with that. I’m just happy people are reading. Thank you for interview and for allowing me to promote my book. Blog Writer's Note to Author: Although, I only read the free preview for "Warfolkan" that Amazon.com gives, I can truly say that I'm sure there is a market for this book. I have to admit that when you suggested I read your blog that I wasn't sure what to expect, but I have to admit that I quite enjoyed it. You have a direct humor that is quite endearing in your blog posts. So, much of what you've written on your blog I could relate to as a self-published author myself. I wish you the best of luck in finding your audience for this book, and I personally hope you consider writing and publishing another. Thanks for the interview.